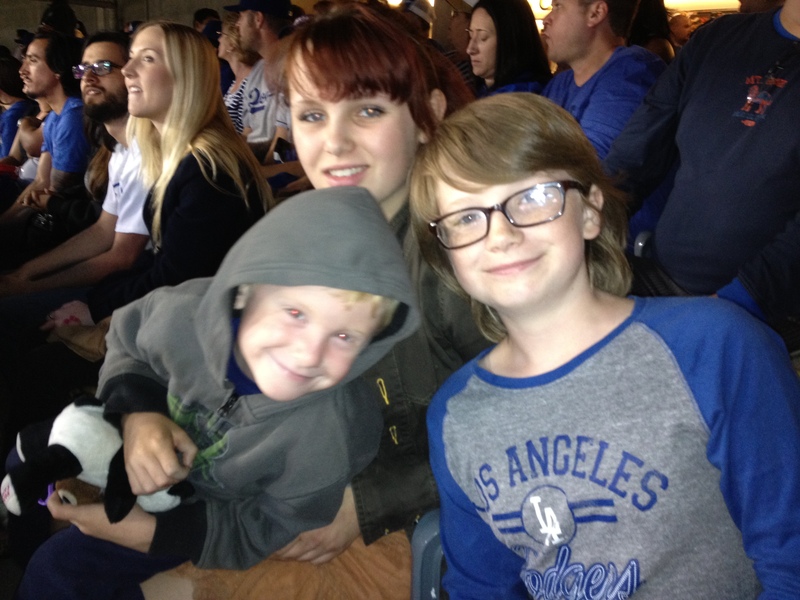 Marc, Tom & Lina at the Saturday night Dodger game against the White Sox. 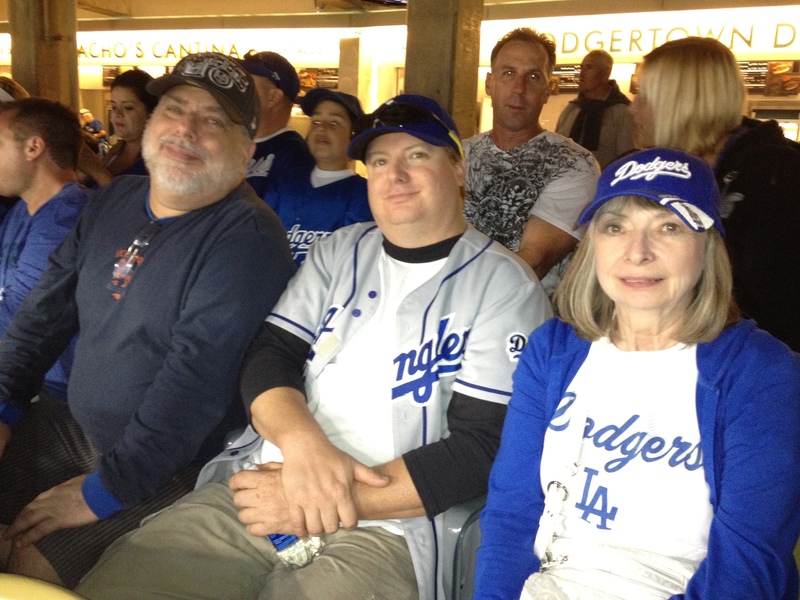 My husband Tom loves baseball with a passion, so for the past few Father’s Days, we’ve taken him to a Dodger game. It’s a perfect tradition – leave at noon for the 1:10 game, stuff ourselves with Dodger dogs, cotton candy and this incredibly tasty ice cream bites treat called Dibs, and take in some sun. It’s a bummer that Emily and Mary can’t make it since they spend Father’s Day with their dad (my ex-husband), who of course trumps step dad, but we take Jake, Tom’s mom Lina, and one or two of Tom’s childless buddies. A few weeks ago Tom revealed to me he actually isn’t as fond of this tradition as I thought he was. In fact, it turns out that he not only hates day games (too much sun), but frankly he doesn’t like going anywhere on a Sunday, even if it does seem like fun. Apparently he would like to spend and entire day resting up from weekend fun, which basically nixes any holiday that falls on a Sunday – Father’s Day, Mother’s Day, Easter. If he had his way he would hold Hallmark hostage until the card company switched all those big days to a Saturday. Better yet – Monday so he can get a holiday from work. This actually works out better for all of us since it means that Emily and Mary can join us. They don’t really follow the game, but they do like the food. The girls and Jake also like clapping with the organ, doing the wave, and trying to hit the illegal beach ball that gets bounced around in the stands. We brought our friend Marc, a huge sports fan (he attended every single home Kings game and three that were out of state), but he’s got a bah-humbug attitude about these activities. I was afraid that Marc was going to climb over the bleachers and pop the beach ball with a sharpened soda straw. 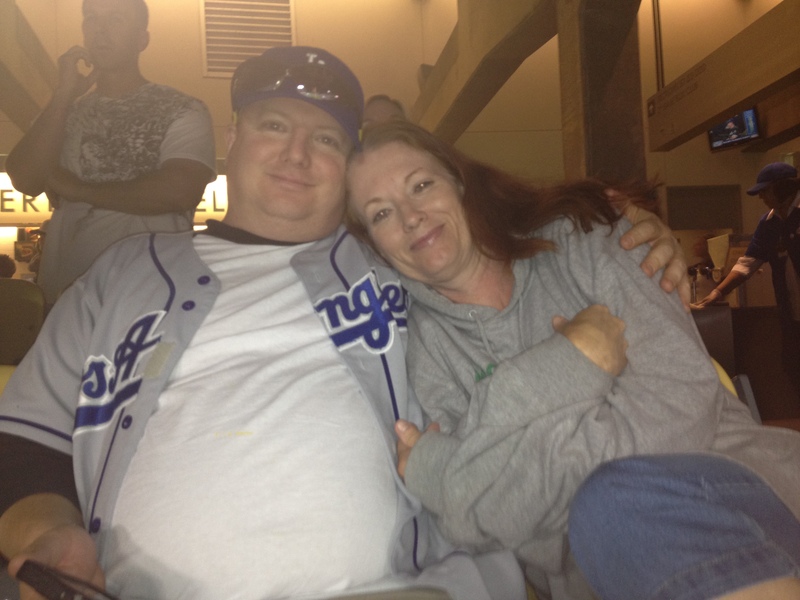 Still, it’s always fun to go to any sporting event with someone who’s a fan of the game. Tom had a bit of a damper for this year’s Father’s Day. He came home from work early Friday with a horrible upset stomach and it lingered on through the weekend. Although he trudged through the Dodger game, he didn’t really feel like eating anything, which is kind of like going on a cruise when you’re in the middle of a cleanse. Sure, you’ll have a good time, but the meals are a big part of the trip. On the other hand, I gorged myself on a platter of garlic fries which were dripping in either oil or butter, and then it ended up reeking from my pores all night. Needless to say, Tom spent Father’s Day Eve sleeping on the sofa. There’s nothing like garlic sweat to really mess up an already upset stomach. The next morning, the kids and I cooked Tom a special meal of extra-thick bacon and a huge omelet with extra cheese, or what should have been called The Clogged Artery Breakfast. I was still full from the night before, the girls we going to eat breakfast with their dad, and Jake was dying for a Poptart since it’s a treat he only gets on the weekends. So Tom was left to eat by himself, or at least pretended to eat while we were watching. With his wobbly stomach, he probably dumped it in the trashcan as soon as we left the room singing Happy Father’s Day to You. The girls departed with their dad, which left just Jake and myself to celebrate Tom’s fifth year of fatherhood (sixth if you count Jake kicking around in my stomach). I figured it was Tom’s big day and he could spend it any way he wished. And his wish? : to be left alone to watch westerns all day and play the MMO game Dark Age of Camelot with his virtual friends. Just one funny card. No gift to open. Lina bought the Dodger tickets and I bought all the food there, and since Tom didn’t feel like eating, that pretty much means that I gave my husband bupkis for Father’s Day. 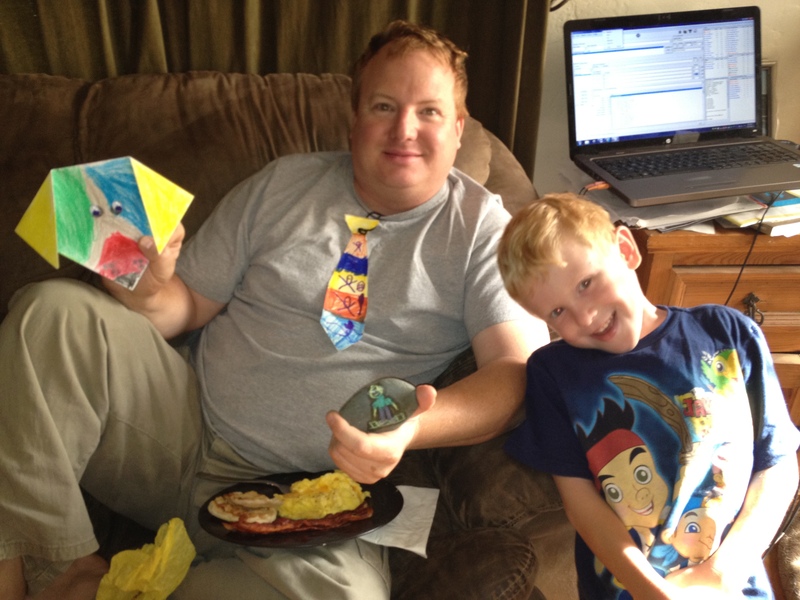 Jake drew a picture of himself on a palm-size rock and made a paper tie for his dad. We gave Tom his wish for the most part. Jake played with Legos. I cleaned the house, which was so filthy it should have had cauthion tape stretched around it. Jake and I ran some errands and brought Tom some minestrone soup for dinner. Pretty boring. 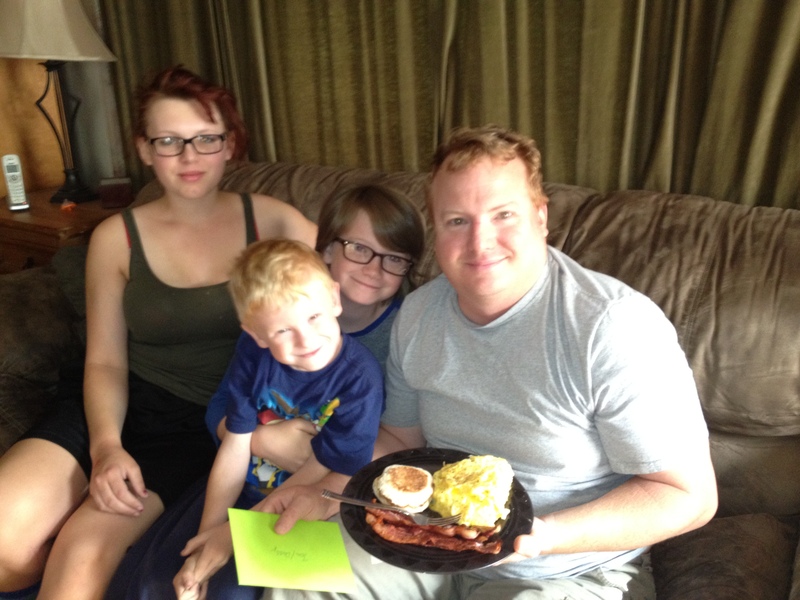 But for my low-maintenance husband and his queasy tummy, it was a great Father’s Day. The nice thing about today is that it will be very easy to top it next year. If you’re a dad, I hope you got exactly what you wanted for Father’s Day. My arteries were clogging just reading your blog. Thank God for the minestrone soup. At least there’s something healthy in there.